“Cinema Vivante” is a celebration of imagination and innovation. Imagine yourself in the idyllic French countryside in the 1930’s. Sometime before dark, a gypsy caravan sets up camp in a field outside of town, luring the locals out for an evening’s fun. The wanderers travel with a film projector, pointing it at the side of a barn. As the images flicker to life beneath the stars, gypsy musicians play their guitars and fiddle, matching every movement on the screen. 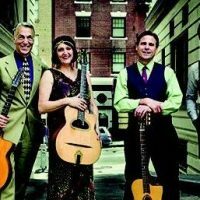 Reviving this lost entertainment, The Hot Club of San Francisco presents an evening of vintage silent films accompanied by gypsy swing. This charming performance celebrates music of the past with intricate, scorching and often brilliant renditions of the film’s original score.